WARNING: This post includes graphic photographs of a deceased pygmy sperm whale. This post may not be appropriate for everyone so please proceed with caution or skip this blog. Deceased animals are a common part of our work in the Stranding Department. There are many reasons an animal may wash up dead or die on the beach. Natural causes such as old age, failure to thrive for a pup or a calf, disease, human interaction such as encounters with fishing materials or ship strikes, and predation by other marine species. This list is by no means complete, it is a short list to reinforce the concept that, like people, animals die too. It is important to perform a necropsy (animal autopsy) on marine mammals and sea turtles to try to determine the cause of death. The longer the animal has been dead the more difficult this task becomes. As an authorized marine mammal responder on behalf of the National Marine Fisheries Service (NMFS) we are obligated to collect a certain set of data depending on the condition of the animal when found. So, on to the story of the pygmy sperm whale ... this animal was found dead in the surf in Winthrop, Mass. on Monday night. I'll start you off with a distant photo so you can test your stomach for this sort of thing. 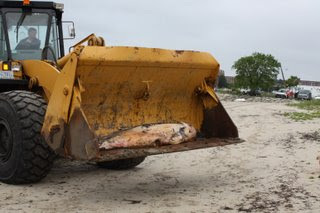 In the image below, the Department of Conservation and Recreation relocates the animal to a beach were we can conduct a necropsy examination and then bury the animal deeper the 6 feet. Pygmy sperm whales, (Kogia breviceps) are fairly rare north of Cape Cod, however we do see them from time to time. Species identification, age class, gender, condition of the animal, and measurements are of the utmost importance. When this pygmy sperm whale washed ashore, it had been dead for a few days at least. Most of the skin was missing and the eyes were sunken in. With the skin missing, most of the obvious field markings were gone. To determine exact species of an animal in this condition it is best to look at the overall size, shape and location of the dorsal fin, shape of the mouth and the the shape, location and number of teeth. Pygmy sperm whales have a small narrow lower jaw with long sharp curved teeth located only in the lower jaw. In this photo, I examine the teeth for shape size and location to confirm that this animal is a pygmy sperm whale. Pygmy sperm whales can often be confused with dwarf sperm whales which, look almost exactly alike. This photo shows the animal in the surf before we removed it from the water. As you can see most of the skin is missing with the exception of the long black patch. Note how far back the dorsal fin is located ont his animal, this is one of the distinguishing characteristics between the pygmy and dwarf sperm whales. We completed a detailed external examination of the animal before we began the dissection or necropsy. We found a linear (straight line) scar (one of several). This is a sign that this animal had some sort of encounter with a made-made object. The technical term for this finding is called evidence of Human Interaction. I decided not to include any photos of this animal once we began making our cuts to enter the body cavity. I'll explain here that we examined all the organs and the tissues under all the scars. The dissection of this animal took several hours. While we had the help of three interns, Adam and I did all the cutting and organ examinations. We learned a great deal from this animal and wish to thank the animal control officer in Winthrop, all members of the harbor master's office in the town of Winthrop, the staff from the Department of Conservation and Recreation, and the Massachusetts Environmental Police for helping secure this animal and providing support for us to perform this important necropsy. While our turtles are still doing great in the Sea Turtle Recovery Room [The space that housed the Sea Turtle Recovery Room is now The Trust Family Foundation Shark and Ray Touch Tank. Rescued sea turtles are now cared for at the new, much larger Animal Care Clinic in Quincy. ], I thought I would post about seal pup season, which is now upon us. Harbor seal pups are now being born along our coastline. Here are some tips and information about viewing seals. First thing to know is that it is completely normal for a seals to rest on shore. These animals are semi-aquatic so they spend part of their normal life "hauled out" on dry land. A healthy little harbor seal (Phoca vitulina) pup. They are cute but it is illegal to approach, touch or harass any marine mammal in any way. All marine mammals are protected by the Marine Mammal Protection Act which makes it illegal to touch harass or alter their normal behavioral pattern in any way. Doing so can result in heavy fines and arrest. Harbor seal pups will spend approximately four weeks with their moms before being weaned at which point the seal mom leaves the pup to fend for itself. During the nursing period the mother seal will leave the baby alone while foraging. A mother seal will not return to the pup until it does not see any people around it and even though you may not see her she definitely can see you. The best thing for these seal pups is to stay with their mom until they are weaned. If they are moved from the area or disturbed by human interaction mom may abandon the pup. Never Cover a seal—this may overheat the seal which can cause death because it already has fur and a blubber layer that will keep it warm while on land. "Shivering" is typically a sign of stress which means you are too close to the seal. Never pour water onto the seal—This may inhibit the animals' ability to warm itself. Never try and feed the animal—Foods made by or handled by humans could be problematic for seals. Seals eat live food and will generally ignor items placed near them on the beach. Seals do not necessarily eat daily, they will go back in the water when the want to eat. Do not handle the seal—This is breaking the law! What will happen to the seal when you call our hotline? We will ask a variety of questions to assess the health of the seal and the location. For example we will ask questions regarding the animal's body condition, length, weight, activity level, and alertness. We are boiling this down of course, but this is the gist of it. It is also import for us to obtain an exact location so we can send a volunteer or respond ourselves if necessary. If the animal appears to be resting with no signs of distress we will put the animal on "watch" which means we leave the seal on the beach and do additional health assessments once or twice a day until the animal returns to the ocean on its own or we determine that there is indeed a health problem. It is very important to call us right away if you happen to see an entagled seal or a seal with an injury. When viewing wildlife it is always best to admire from a distance so that you can enjoy them behaving in a normal manner. You can find out more about what the Marine Animal Rescue Team guidelines on these pages. Hello from the 4X4ers on the stranding team! We are happy to report that we successfully completed the second day of our off-road training with the staff at Overland Experts. This was by far one of the most important trainings I've taken in my years at the Aquarium. We gained a skill set that will keep us safe on the beach while rescuing marine mammals and sea turtles. Ever wonder how our Rescue team gets to some of these remote locations where injured marine mammals and sea turtles often strand? Carefully! Okay, it's not quite that easy. We have a giant 4x4 that we use to drive down the beach or over rough terrain to reach the animals. In our department we spend a significant amount of time training to make sure we are safe, the animals are safe and that we take great care in preserving the beaches and other sensitive habitats that we travel over. Recently, we decided we wanted more training in off road driving using our winch and self-recovery. So we enrolled in a training course with Bruce Elfstrom through his company called Overland Experts. Bruce is the leading expert on 4x4 instruction, he is a certified Land Rover instructor and holds multiple other related certifications. Bruce started our training with a dynamic interactive lecture of 4x4 systems. Using a model he built, Bruce taught us about differentials, power distribution, transmission, suspension, transfer case, beam axle versus independent suspension, tires, and more. We all really enjoyed this part and finally have a clear understanding of the systems and why they are important in different situations. Now comes the fun part...Bruce and his staff took us out onto the course to put our new information into practice. Bruce teaches us about beam axle suspension versus independent suspension and about the limited slip differential on the rear of our truck (in reality we learned that in the few seconds after the back right tire left the ground but Bruce also needed to teach about the capabilities of our truck). Kerry takes our stranding truck to the top of the incline, however the descent on the other side is so steep that the truck never levels out. Kerry has to line her wheels, select her path and put the truck in 4 wheel low and take her foot off the break. Bruce taught us the engine breaking technique in the class room. Bruce also taught us to walk our route before driving it, a safe step that prepared us for each part of the course.